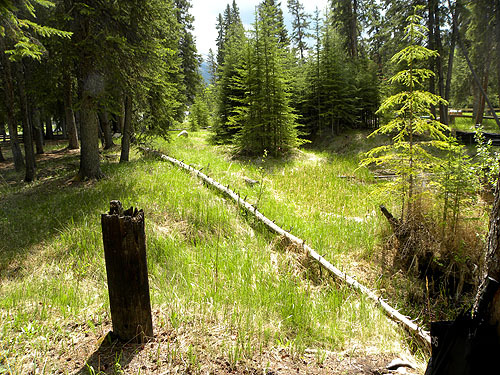 We began our search by locating the Boat Canal which begins approximately 800 feet from the Banff Avenue Bridge. One side of the canal is still lined with rocks. 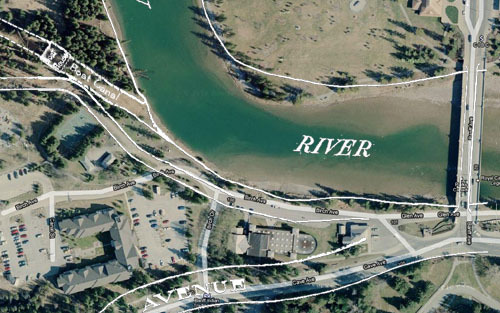 The Boat House was located approximately 250 feet from the Bow River's edge. By rough calculation the dimensions of the Boat House were approximately 50 x 60 feet. Interestingly, about 300 feet from the edge of the river we located the remnants of a pole. A corner post? An old power pole bringing electricity to the Boat House? As we continued on down the canal close to the ball fields and stables, there was still standing water and areas that were very marshy. Could this explain Image 7? 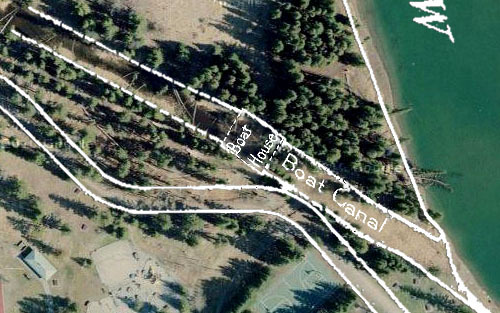 1: When superimposing the survey over the areal view, we are able to locate the original site of the Boat House and Canal, approximately 800 feet from the Banff Avenue Bridge. The shallow Boat Canal leads to a Boat House, and continued on, ending very close to the original site of the Pavilion. Could this Canal have increased the flooding in the immediate vicinity of the Pavilion, eventually accelerating its deterioration? 2: From the Boat Canal, looking back toward the Banff Avenue Bridge. 3: Detail of the existing Boat Canal and site of the original Boat House. 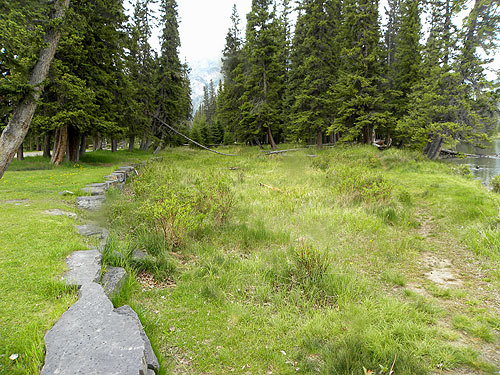 The original road leading to the Pavilion from the bridge has been abandoned. 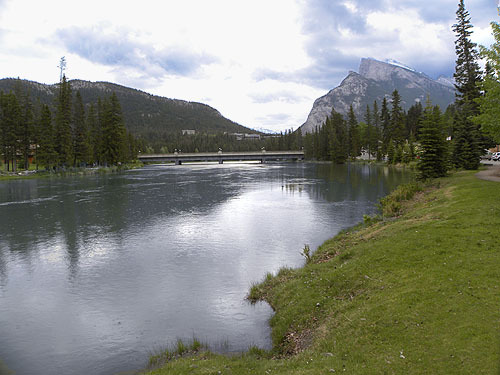 4: The Boat Canal is located approximately 800 feet from the Banff Avenue Bridge. The rocks lining the left side of the canal are still visible. 5: The rocks lining the left side of the canal are still visible. 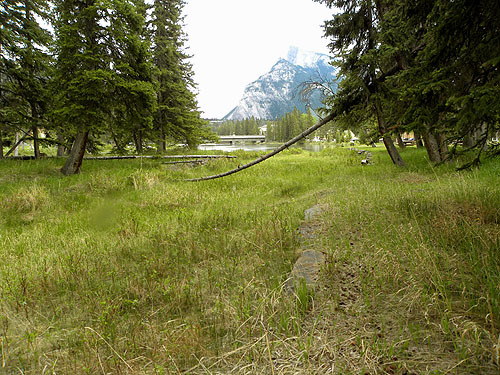 Looking up the Canal toward the Boat House which was located approximately 250 feet from the Bow River's edge. 6: Looking back toward the Bow River and the Banff Avenue Bridge. The rocks lining the canal are still visible on the right. 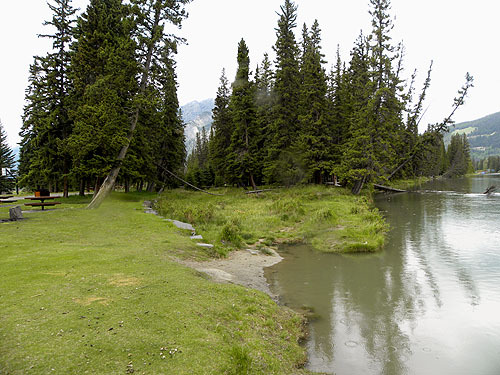 7: The Boat House was located approximately 250 feet from the Bow River's edge. By rough calculation the dimensions of the Boat House were approximately 50 x 60 feet. Interestingly, about 300 feet from the edge of the river we located the remnant of this pole. A corner post? An old power pole bringing electricity to the Boat House? As we continued on down the canal close to the ball fields and stables, there was still standing water and areas that were very marshy. Could this explain Image 7? Text and photographs by Douglas M. Steiner, Copyright 2010.